We're pleased that Lydia has had the opportunity to interview Timo-Pekka Mets�l�, a Finnish amateur astronomer. Timo-Pekka is an accomplished astrophotographer and has contributed some impressive images of Venus to this website. If all you've ever heard about Finland are the world famous cellphone tossing contests and hockey player Teemu "The Finnish Flash" Selane, you might not be aware that the country boasts impressive astronomy observer statistics. Hi Lydia! It is estimated that Finland has the largest number of amateur astronomers in the world per head of population. According to URSA (URSA Astronomical Association) there are between 12,000 and 13,000 astronomy club members. Of course not all of them are actively observing. In addition, there are about 40 local astronomy clubs in Finland. The general public here does indeed love astronomy and has quite a good understanding of it. When did you join URSA? Have you been part of the Finnish astronomy community for a long time? URSA was founded in 1921. I have been interested in astronomy since childhood and I became a member of URSA, the largest nationwide astronomy club, in 1979. As you can tell by the statistics, the astronomical community in Finland is very active. Is your Cygnus Summer Meeting similar to our Texas Star Party? Unfortunately, I have never been to the Texas Star Party so I do not really know what it is like. It is my dream to attend sometime in the future. I attended the Cygnus meeting for the first time this summer with my family. Unfortunately, there was not very much observing taking place because the skies are still too bright in July here in Finland. Instead there were meetings and astronomy lectures, camping, barbecuing, swimming in the lake, bathing in the sauna and generally having fun. There were about 150 attendees from babies to those aged 70. Is your URSA Minor Newsletter online or print only? The URSA Minor is a small circulation newsletter for the active observing members of the club. As far as I know, it is available only in print, free for the members of URSA. And you have other publications as well? Yes. URSA also publishes a general Finnish language astronomy magazine called "T�hdet ja Avaruus meaning "Stars and Space". It has a circulation of about 18,000 with 7 high quality issues a year. I see on the website that your club also has various student activities. Are your wife and children also interested in Astronomy? Well, my wife says she is interested in astronomy but she does not observe and says she does not understand astronomy. My children, ages 5 and 7, are curious about "space things" but not yet very much interested in astronomy as of yet. It is an unfortunate fact that many astronomy club members have only one active observing member in the family. How's the light pollution and glare in your area? I live in the metropolitan area of the capital city of Helsinki. We have moderate light pollution, with a visual limiting magnitude of about 4.5. How's that working out for naked eye observing? The Milky Way is almost never visible from my backyard. In my childhood and adolescence in lived in a rural area under very dark skies. When I later moved to the city, I found visual deep sky observing nearly impossible which caused a 15 year break from astronomy. Until about four years ago I "discovered" CCD imaging. With a CCD camera I can "see" objects which are visually impossible - and from in the city! That is the reason I started astro-imaging. So do you have a home observatory for your CCD imaging? I do my imaging from the driveway of my house. I do not (yet) have an observatory and my imaging equipment is "moderate" at least when compared to the big boys of CCD. 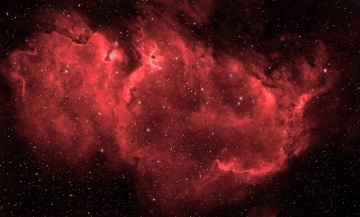 Recently I have mostly been doing narrowband imaging of nebulae which is an effective way to beat light pollution. What's one of your favorite "toys"? An H-alpha filter is a fantastic thing, because I can image in the city even under a full moon. I am also doing some planetary imaging but seeing here is usually not very good. Imaging planets is fun and does not take up as much time as deep sky. Timo-Pekka says the translation of Timo is similar to "Tim" in English. Yes, and "Pekka" comes from ancient Finnish mythology, Pekko, a god of grain, fields and beer. My surname Mets�l� means approximately "a place in the forest". We have very many forests here in Finland. We wish our new friend and possibly our most northern observer dark skies and happy imaging!